(AP) — Officials on Hawaii’s Big Island, where the Kilauea volcano has been spewing huge amounts of lava for months, are bracing for the possibility that frequent earthquakes will cut off a major highway. Emergency officials dealing with the eruption are turning their focus to the aptly named village of Volcano, where dozens of small earthquakes shake the ground every hour as Kilauea undergoes dramatic changes. The summit caldera is also collapsing, causing even larger temblors almost daily. Officials are worried about cracks and holes in Highway 11, a 45-minute lifeline connecting a rural district with Hilo, the island’s biggest city. The alternative, driving around the state’s largest island, can take up to three hours. 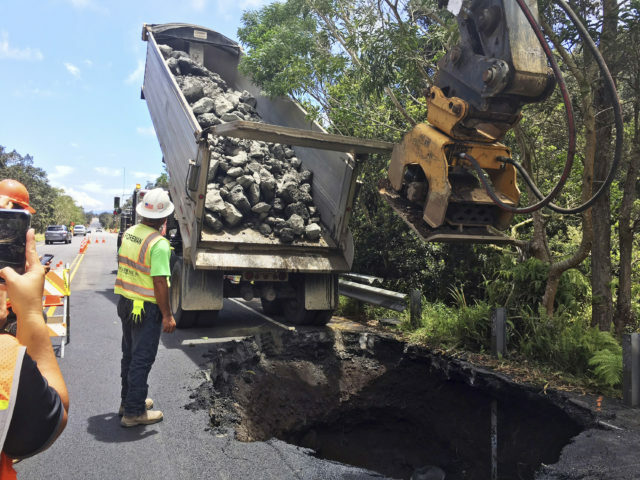 In this July 6 photo provided by the Hawaii Department of Transportation, workers repair a sinkhole in a highway that formed because of earthquakes associated with the volcanic eruption at Volcano Village. A meeting Thursday was set to examine possible evacuation plans, repairs and alternate routes amid continued seismic activity. The highway concerns prompted officials to move the Volcano Fire Station, inside the now mostly closed Hawaii Volcanoes National Park, to a safer area. Highway 11 is critical for those in the island’s southernmost district to get to medical services in Hilo, on the east side of the island, said Jessie Marques, executive director of the Kau Rural Health Community Association. She said her daughter decided move to Las Vegas because she was afraid of frequent earthquakes and getting cut off from her dialysis treatments in Hilo. Molten rock is blasting from one eruption site, a large cinder cone in a hard-hit neighborhood where new volcanic cracks first opened on May 3. It’s sending huge volumes of lava snaking to the ocean miles away. An estimated 700 homes have been destroyed, more than 500 of those in just two days, and thousands of people have been displaced. One man was injured in the weeks after the eruption began, and another 23 people were hurt July 16 when lava entering the ocean exploded onto a tour boat.